WF: Thank you for your interview pledge, we hope that you are doing good? MD: You’re welcome. Little rough after breaking my rib at the last wXw/IPW:UK Joined event 6th of December. But i’ll be fine. WF: You are in the wrestling business for more than 12 years now, and you already had some ring names. Why did you choose “Anthony Zeus” as your ring name and what’s the story behind it? MD: Growing up I was always really fascinated by Greek Mythology and everything behind it. I wanted to go with Zeus, just needed a good name before that.. So I went from A to Z, Anthony Zeus. I was young. Ha. 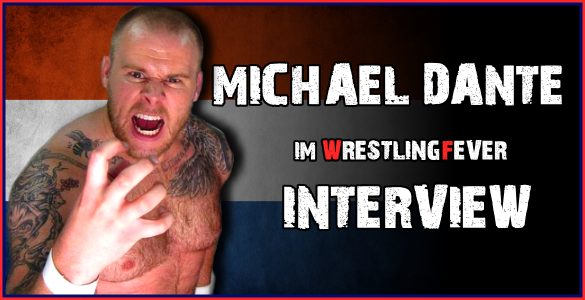 WF: In Germany you are more known as a tag team wrestler, but you also have singles matches. What do you like more? MD: Tag Wrestling. That’s really where my heart is, alongside Tommy with the Death Squad. WF: Do you think that the Sumerian Death Sqaud pushed your career? MD: It obviously gave us an extra edge. It was something new which we really wanted to do and show to everyone what really interested us and drove us. WF: How do you deal with criticism? MD: To some degree you need criticism because you can use it to better yourself. If all you do is criticize and give nothing back, you are no good to me. WF: How is the business in the Netherlands, is a singles run an option for you? MD: The business in Holland is growing. Keeping in mind we have a sober minded people living here.. So it’s never really going to catch on like Kickboxing or MMA would for instance. But it’s growing. A singles run wouldn’t be an option for me because TAG is where it’s at. WF: In Germany you are usually at the wXw shows. There are recently exclusive contracts – what is your opinion about that and do you think that this is the right way to ”tie” wrestlers in Europe? MD: Being the biggest company in Germany, I agree with wXw wanting to “tie down” personnel. WF: Do you review your own matches? MD: Sometimes yes. Being critical towards yourself is what makes you grow as a person and as a professional Wrestler. WF: When did you made the decision to become a „Wrestler“ and who inspired you? MD: That was in Primary School where Tommy and I were both on.. Probably watching old WCW which was on the telly at the time. WF: Do you have role models or idols? WF: What are your goals in the wrestling business? MD: Do as much as possible in the time that I’m still willing and able. Return back to Japan and start making Sumerian Death Squad a fact in Japan. WF: You are not only a wrestler, you also work as a promoter – how did you become a promoter and why? MD: I’m not promoting anymore. We used to promote for PWH, untill our schedules couldn’t take it anymore. After that, we helped a bit with PWS, but that too cost too much time. Tommy and I currently run our own Wrestling School, which is pretty cool! WF: You are also working as a commentator – you seem to be an allrounder? What are you doing for a living and what are your hobbies? MD: Once a blue moon I did commentate. My main job is an IT Consultant. Apart from Wrestling and working I enjoy Gaming, watching movies/series and working out. Although the latter is a tough one with my past and current injuries. WF: Thank you much for the interview! MD: You’re welcome! Happy holidays everybody!